Maureen and George call Colorado Springs home but truly enjoy the world. We have visited all 50 states and 24 countries. We’ve always been a bit adventurous and that continues now that we’re retired. 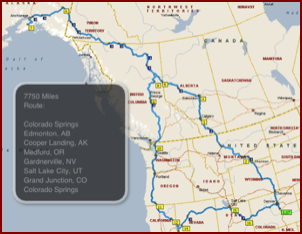 Packing our RV, which we got in 2008, we have done a quick east coast leg to get us ready for the 2009 summer in Alaska. 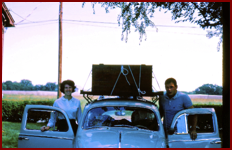 Our adventures started in 1965 when we packed all we owned and hopped into our VW in Massachusetts. Just before we left, we bought camping gear and headed west. We luckily ended up in Colorado after traversing Canada from the Niagara Falls to Vancouver. Oh - it should be mentioned that Maureen was 4 months pregnant with Andi when we left. We picked up the rig in Elkhart and proceeded to put on 6500 miles with an east coast excursion. We took 5 weeks and visited the heartland of America, the Northeast, Lancaster County, PA, the Washington, DC/ Annapolis area and then a return trip just south of the Mason-Dixon. Now 5 kids, 5 kids-in-law and 9 grandkids later, we are continuing with this adventurous approach to life. At the end of September of 2008, we tried to stimulate the economy and Chrysler truck sales by buying a Dodge Ram 3500 dually. We needed a large vehicle to tow the RV we intended to purchase. We embarked on a “help Elkhart, IN retain jobs” effort by purchasing a Heartland Bighorn RV in October. By the time we returned, we had visited 14 states. This has now grown to 21 states and 4 Canadian provinces. The sights we've seen and the people we've met are what make these experiences some of the best times of our lives. With that experience under our belts, the next logical trip was Alaska. Of all the states that we had visited. Alaska easily ranks as the most amazing. It only makes sense to return there and get to appreciate the state even more. After making an all too brief trip in 2004, we packed up the RV and headed north. We spent the summer in Cooper Landing on the Kenai Peninsula in a Workamper opportunity and loved every minute. Please follow our experiences by reading our blog-based journal. We tried to describe the high points, the not so high points and even the errors in judgement and luck.